I’ve been looking for ways to feel like a fish out of water while I take my hiatus from triathlon racing. I got so comfortable in the world of triathlon, something that many people experience as awkward. As a coach, I consider empathizing and guiding people through the awkward stage a critical professional skill. I think coaches should regularly find ways to be completely out of their comfort zone. Summer 2016 I did GMB Focused Flexibility and Elements programs. The first weeks were awesome. Then progress became excruciatingly snail pace slow. The program was also entirely online and I was ready to up the awkward ante. Winter 2017 I tried ExperTease’s Fiercely Flex class. The whole loud music, burlesque and pole dance approach was not for me. There was some stretching going on, but generally I felt a whole lot’a unsexy disjointed awkwardness. Spring 2017 I spent with Querencia Fitness – Adult Gymnastics. Gymnastics was way more fun and much closer to my comfort zone. I still had some pretty great failing moments. “Is this it? Am I doing it?” Immediately followed by falling over and giggling on the floor. Now in the Summer of 2017 I’m trying Fundamental Ballet with Zenon Dance School. After trying a hip hop class and observing one ballet class I signed up. Immediately I biked way way out of my way to arrive at a dance supply store, dirty and drenched in sweat. The teenage employee was surprisingly gracious and helpful. I was so excited to have new “sport gear” that I walked out of the store and had to put on my brand new ballet slippers. I’ve now taken three classes. In my mind I’m a natural Misty Copeland, looking all effortless rocking elegant athleticism. She’s my new hero. In reality I know I’m still a fish. A fish trying to be a ballerina. Yup. That’s more like it. 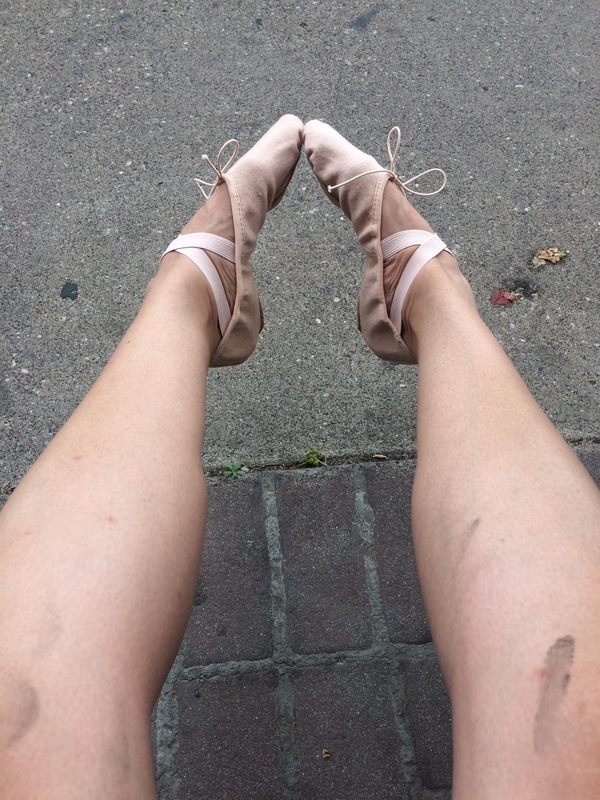 This entry was posted in Fitness and tagged coaching philosophy, fish out of water, flexibility goals, learning ballet, not Misty Copeland, trying new things, Type 2 Fun. Bookmark the permalink.